The holiday season is a time that reminds us about the important things in life, like spending time with our loved ones, helping people and spreading that holiday cheer. Frank is Jewish, and I am Catholic, so growing up we had our own customs and traditions. Growing up, my family celebrated Hanukkah, with a pinch of Christmas thrown in for good measure. As a child I went to a Jewish Parochial School. I spent half my day with an English teacher learning things like math and science and the second half of my day I was learning Hebrew and studying the Old Testament. Around the holidays we would learn all the traditions and songs that accompanied them. Needless to say, I was pretty excited to go home to share with my family all the things I had learned. At Hanukkah we light candles to remind us of two great miracles. First, how Judah Maccabee led the Maccabean Revolt (they named the army after him because he was so awesome) against the Greeks and took back the Temple in Jerusalem. Second, we celebrate the miracle of the oil needed to light to temple for worship. The Maccabees found one jar of oil in the temple that the Greeks overlooked which had enough oil for only one day, but it lasted for eight..
We did have a few traditions that included lighting the menorah, giving gelt (not to be confused with giving guilt, which I am really good at giving BJ!) and going on a family vacation. For some reason it is customary to give money or "gelt" for Hanukkah, I have researched why this is and have never really found a good reason, but trust me I never complained when money was handed to me! Now we give all our nieces and nephews gelt. We lit the menorah every night for eight nights. My brother, sister and I would receive small gifts and gelt every night and one big gift on the eighth night! We played with our dreidel and if we were lucky my mom would fry up some latkes (truth be told we had to be very lucky because my mom didn't love to cook! lol). 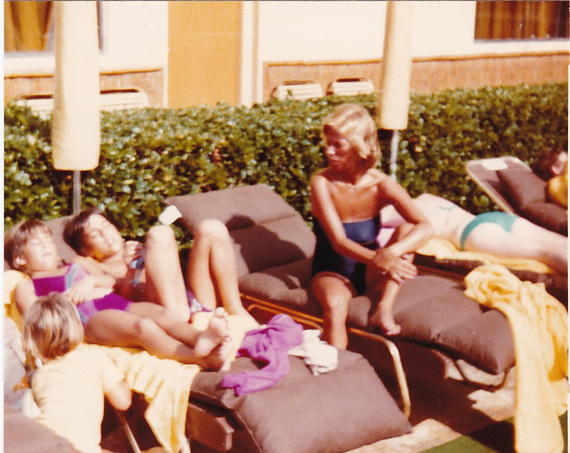 Every December, since I was four years old, we would travel to Florida or Mexico as a family. This was by far my favourite tradition, and the one in which I have to most fond memories. In our house, the Christmas/Hanukkah season was about going to a warm climate and spending time together as a family. This is a tradition that still carries on to this day. This year we are all going on a cruise to celebrate my mom's birthday. Not everyone has this opportunity, and we are so fortunate to travel as a family and spend the time with each other. This is only one of many traditions that BJ and I hope to continue to do when Milo gets older. I mentioned above that we always had a pinch of Christmas thrown into our family traditions each year. We had a nanny that lived with us most of my childhood (since I was the oldest) and we always had a little tree for her. Truth be told, I think I was always pretty excited to put that mini Christmas tree up and decorate it with strings of popcorn. My mother also used to take us for holiday photos with Santa, I guess it is hard to get away from Christmas and even harder to explain to a child why you don't get to celebrate what everyone else in celebrating. It took me many years to realize that being different is cool. I grew up in a Catholic/Italian/Polish family, so going overboard on anything that had to do with Christmas is an understatement. We decorated our house with Christmas lights, put on carols and decorated our Christmas tree, hung stockings by the fireplace, and waited for that first snowfall. I mean what is Christmas without snow, right?! My mom bought my sisters and I each an Advent Calendar, which we would open the little flaps every day to get a chocolate and count down the days until Christmas. On Christmas Eve, we opened our presents after dinner and cleaning ALL THE DISHES, which trust me, felt like an eternity! We all gathered in the living room around the Christmas tree. My mom was in charge of handing out the gifts to us, as she still does. One of the things I looked forward to the most was my grandma's Christmas cookies. She made large tins full of all different kinds:linzer cookies, lemon iced shortbreads, and rum balls potent enough to feel that holiday cheer, just to name a few! Christmas Day we wore our best clothes and we went to church, visited family and then came home and have our Christmas lunch. Being off for the Christmas holidays meant we spent time together, whether working together in the bakery, or going over to our cousin's house to play, we were together. Being a mixed faith family gives us the opportunity to celebrate our own customs and traditions, and create new ones with our son Milo. We celebrate Hanukkah and Christmas, and we will raise Milo to know both his Jewish and Catholic roots. Ultimately, it becomes his decision which religion he will chose, but we are teaching him to be kind, supportive, and empathetic towards others and really that is what every religion should be about. Now having Milo, we want to continue our own family's traditions, but of course create new ones. Both being teachers, Frank and I are lucky enough to have the same working schedule, so family trips are well planned out in advance. Travelling and going away somewhere warm during the winter break is a tradition we hope to continue. Now I will trade the white snow for the white sand! 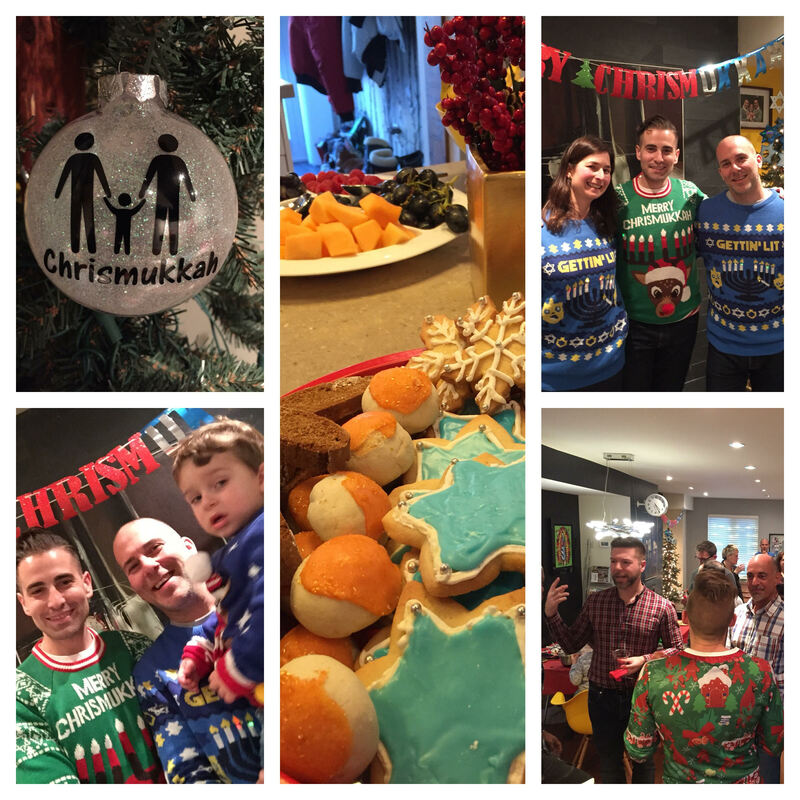 Before Milo was born, Frank and I would host a Chrismukkah Party with our friends. There would be lots of food, a lot of drinking, and a gift exchange. Since Milo was born, our annual Chrismukkah Party has been put on hold, but this year we are inviting our neighbours and Milo's classmates from his Day Care. There will be food, crafts for the kids to do, and some holiday punch for the adults. Chrismukkah was all about spending time with friends, now it means spending time with friends, and kids! My inner baker in me explodes with excitement this time of year! I get to make my grandma's cookies, and lots of them! I love making her cookie recipes, and love giving them out as gifts! Milo even likes to help out! We also celebrate Hanukkah, and we all gather around the menorah and say the prayer and light the candle. We are pretty sure Milo thinks they are birthday candles and will try to blow them out, but teaching him about Hanukkah and why it is important to our family is a tradition we will carry on. We decorate the house with Christmas lights, although not too many. And we put up our tree and top it off with a Jewish Star. It's the perfect way to combine both our religions. Milo has an Advent Calendar which he opens every day, and sometimes sneaks an extra chocolate when we aren't looking! Growing up, my parents took my sisters and I to the Santa Claus Parade. When Milo gets older we will take him, but for now we visit with him and get our annual picture with the big guy. Being Jewish and Catholic allows us to blend our traditions and create new ones for our family. We will continue to wear our matching sweaters for our Holiday card until Milo tells us to stop because it's embarrassing! We will continue to celebrate both Hanukkah and Christmas and teach Milo the significance of both holidays and our religions. We will spend time with family and friends for as long as we can, because there is no better gift than having the time to spend with the people you love.